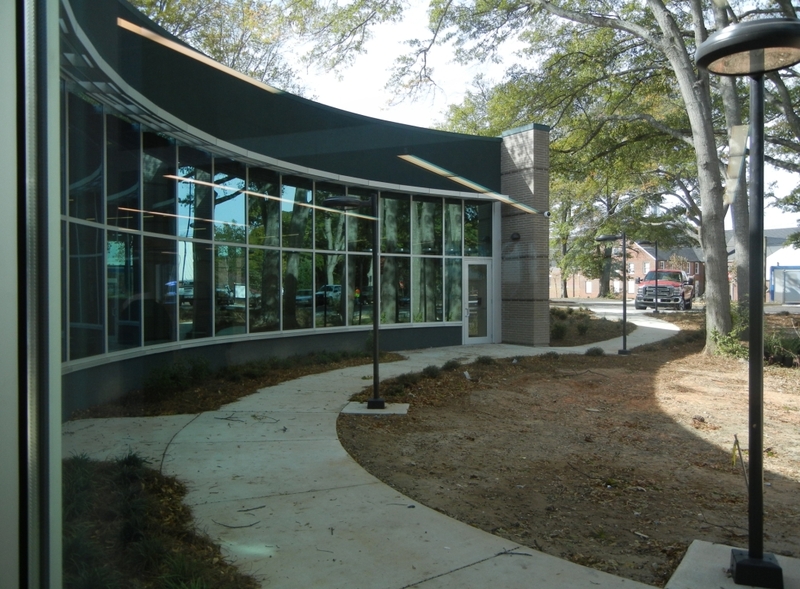 Thanks to the Clayton News Daily for writing up our new branch! 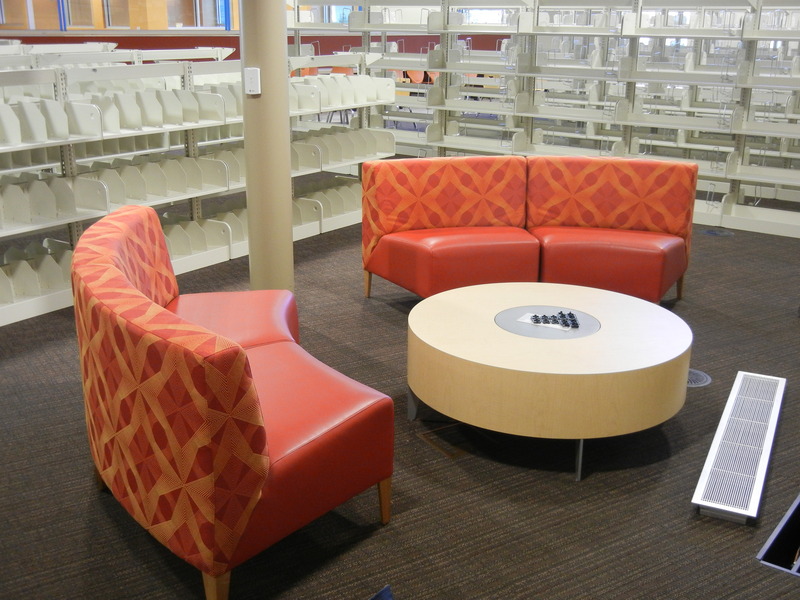 The library furniture has been chosen for comfort, durability, aesthetics. 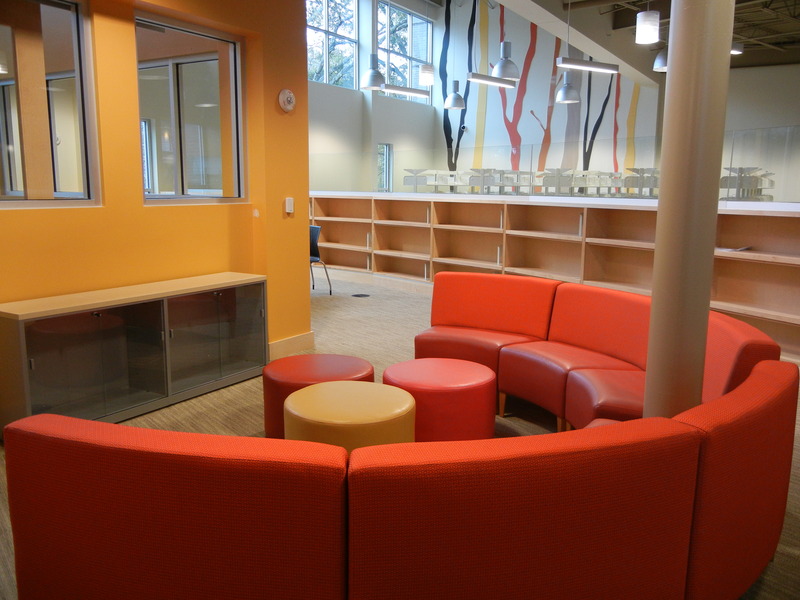 The custom couch in the Teen Zone is made up of several units which can be reconfigured in the space. 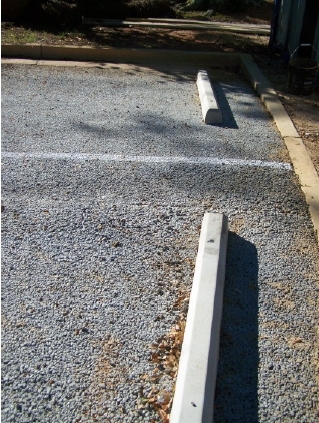 It’s comfortable and sturdy, and the bright upholstery is rugged and dirt-resistant. 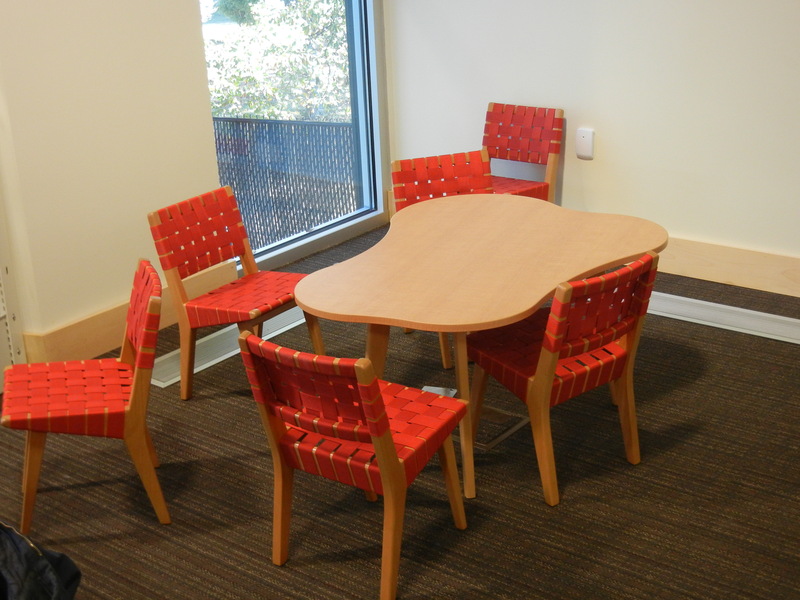 The ottomans can be moved around and used as either chairs or tables, and are also covered with the same sturdy fabrics. 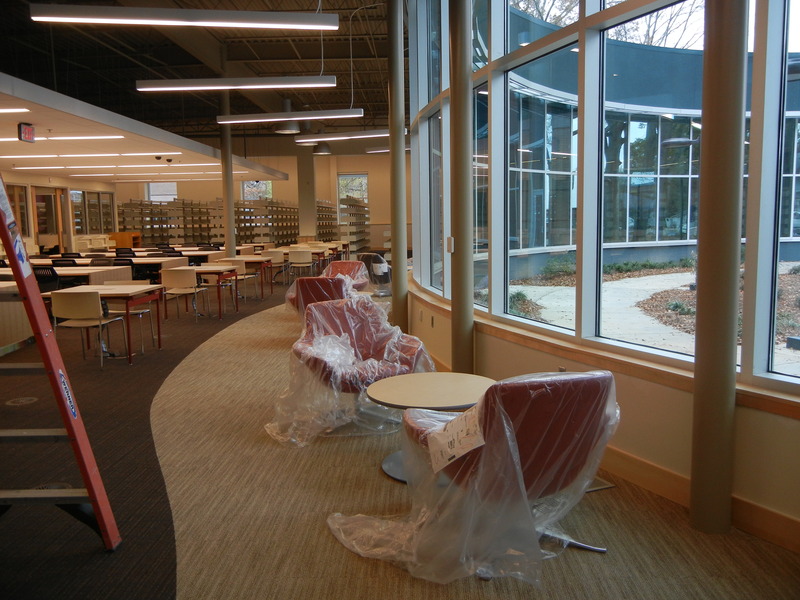 The “Bob” reading chairs along the front window are covered with the same durable fabrics and were chosen for comfort and stability. 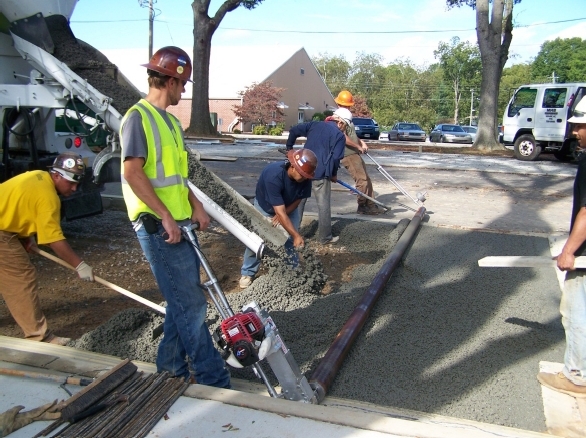 The framework is reinforced and the base is weighted so that they will not tip easily. The curved arms flare to comfortably seat people of any size while still providing arm support. The electrical outlets in the wall also contain charge-only USB ports for convenience in recharging cell phones, iPods, eReaders, and other rechargeable portable electronic devices! 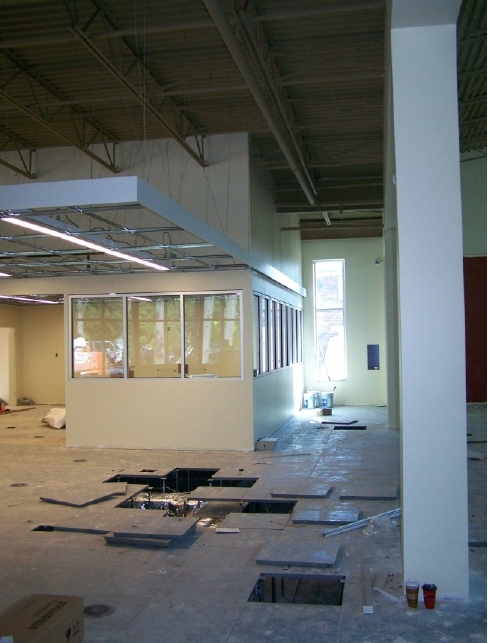 Most of the shelving has been installed and the furniture is arriving by the truckload! 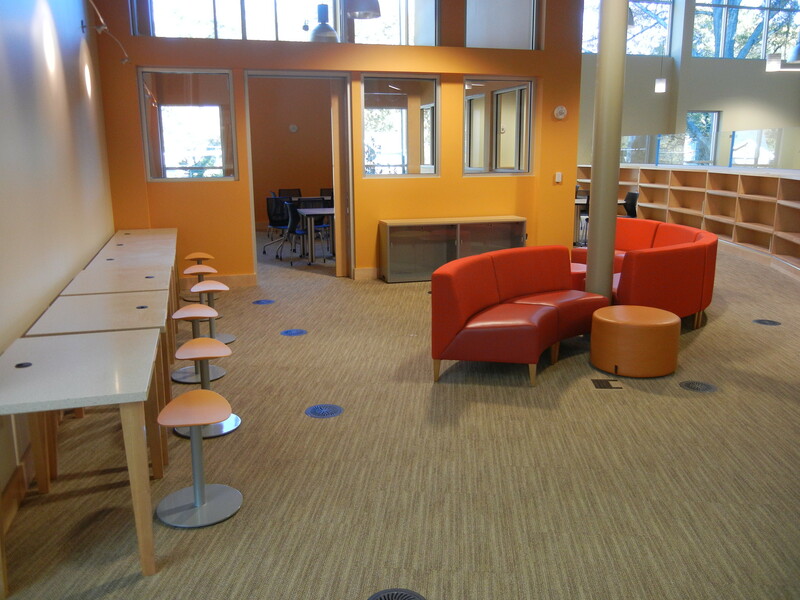 Teen Zone – Computers on the left, leisure area on the right, and homework room in the back. 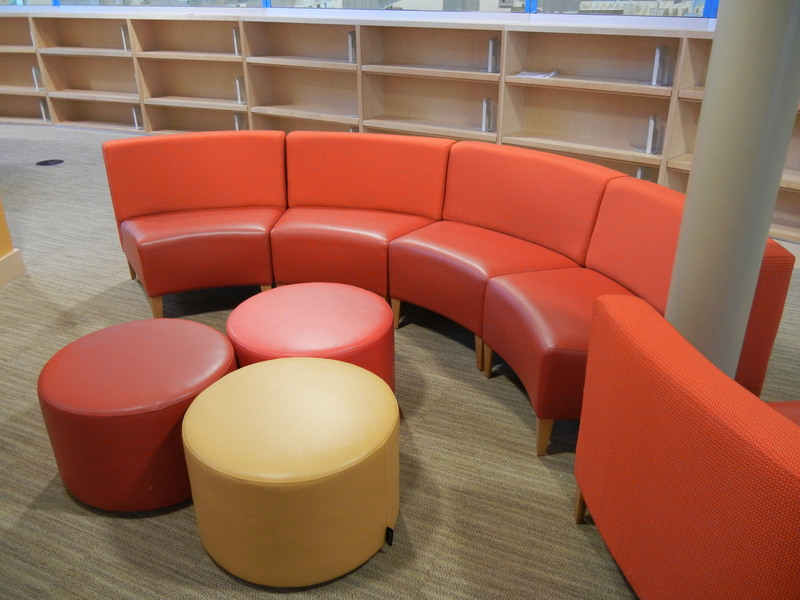 Comfortable seating for parents in the toddler play area. 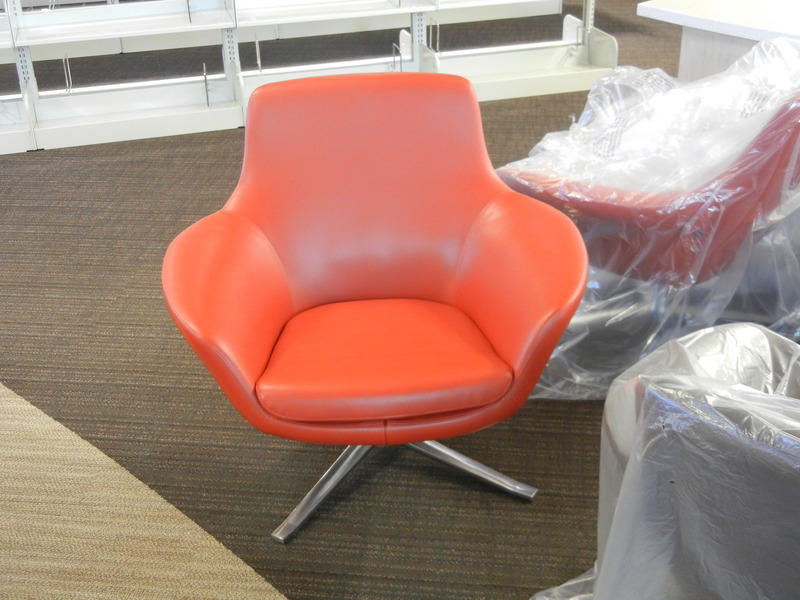 The incredibly comfortable “Bob” chairs will go along the front curved window for leisure reading enjoyment. 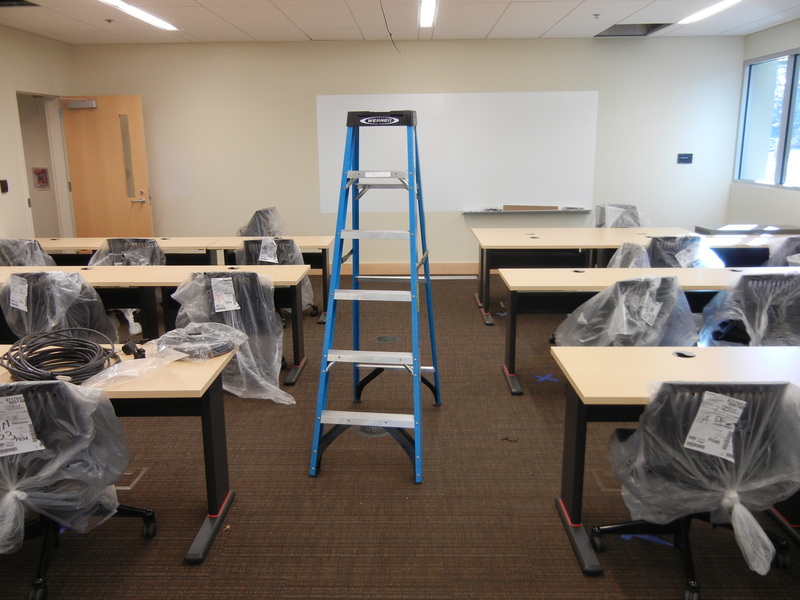 The Computer Training Lab will be able to take up to 20 students at a time! 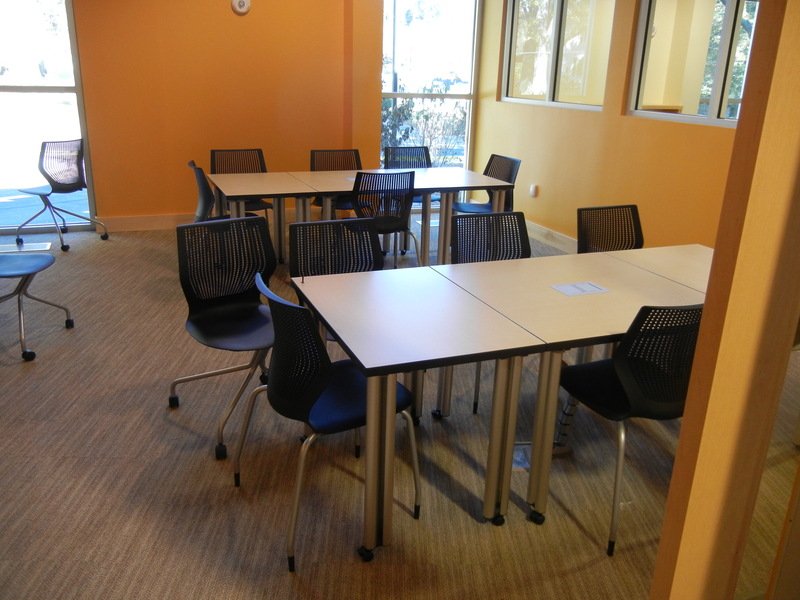 The tables and chairs for the public computer area are in place. 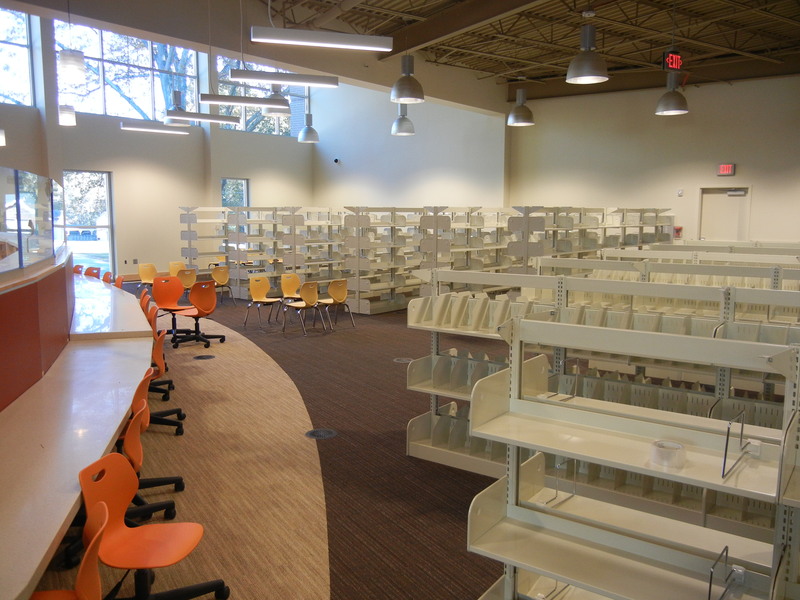 Rows upon rows of shelving for the Fiction and Non-Fiction books! 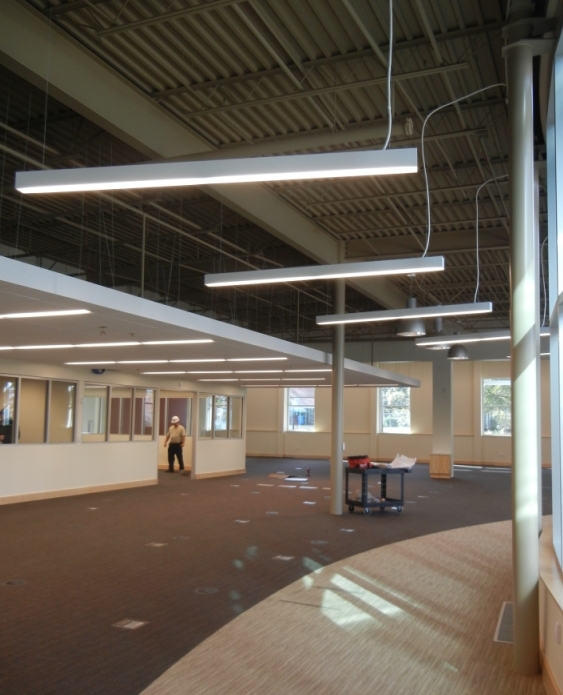 Catalog stations will be on the wooden podiums. 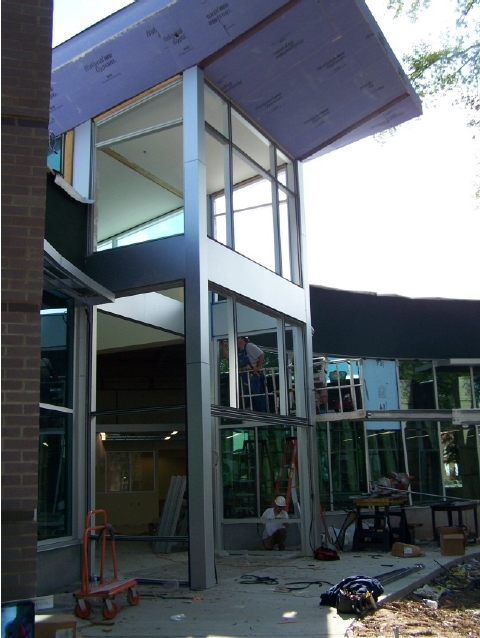 Library staff did a walk-through of the building with the architects yesterday to check the progress, and it’s looking good! 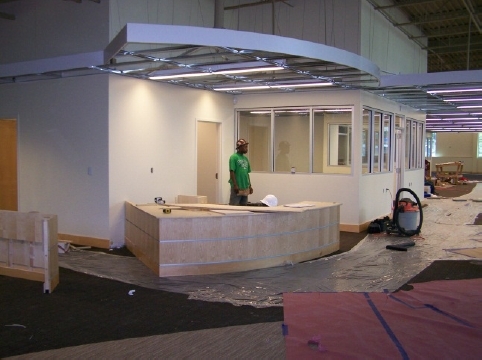 The custom-built furniture, such as the circulation desk, is beautiful, and although there is still a lot to be done, the visual details are starting to come together. 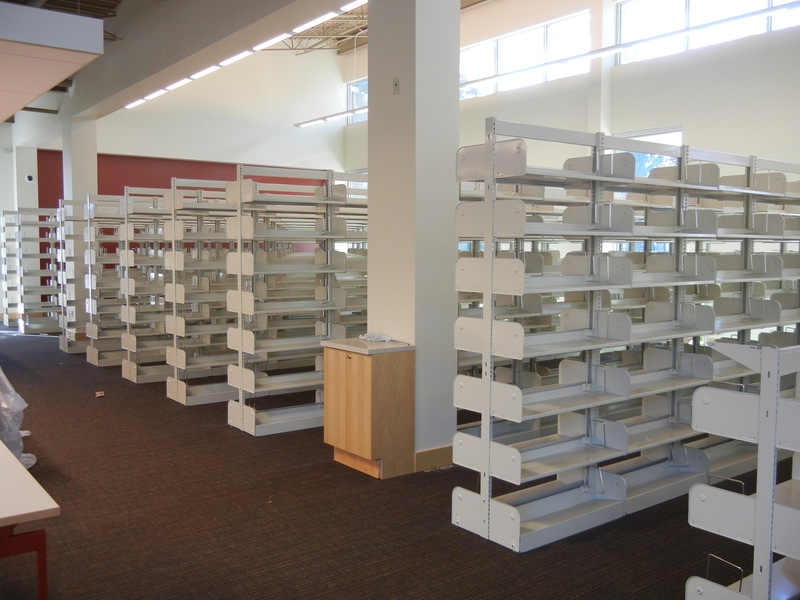 It’s almost to the point where shelving can be installed! 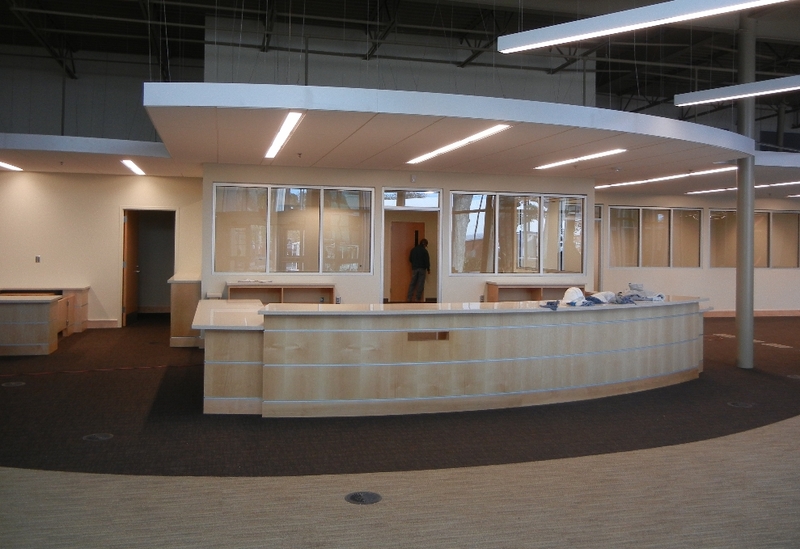 The beautiful new circulation desk! 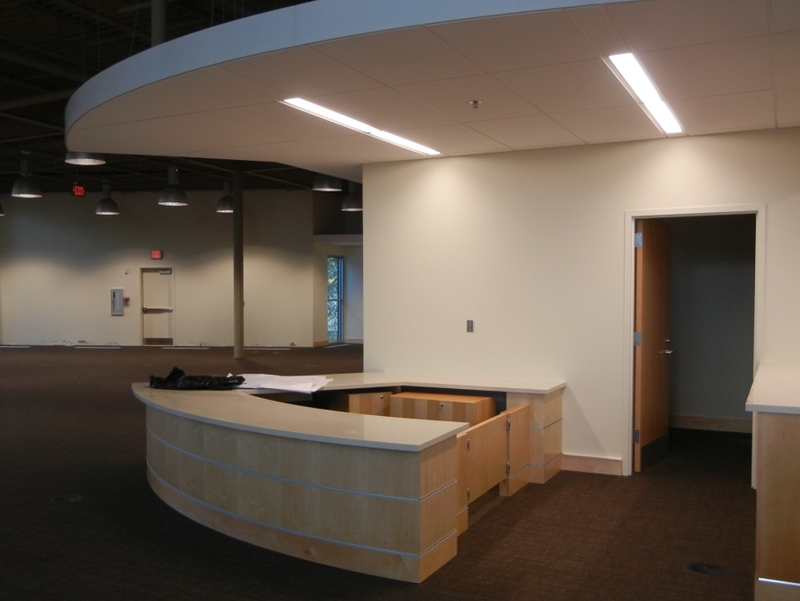 The children’s information desk to the left of the main circulation desk, and facing towards the children’s area. 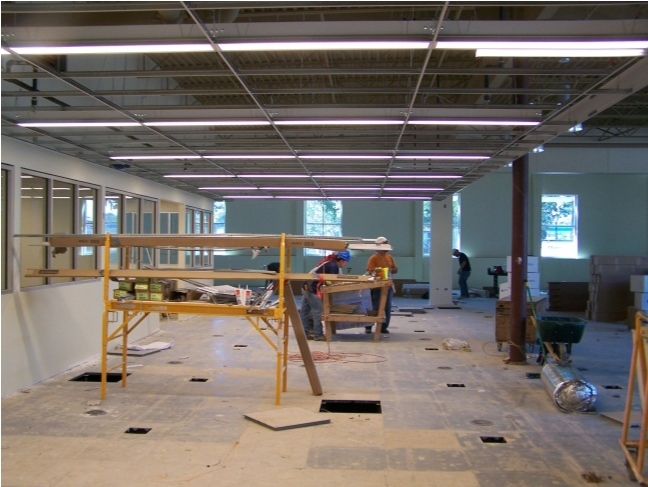 The room behind the children’s desk will be a quiet, private space set aside for nursing mothers. Looking into the teen area from the lobby. 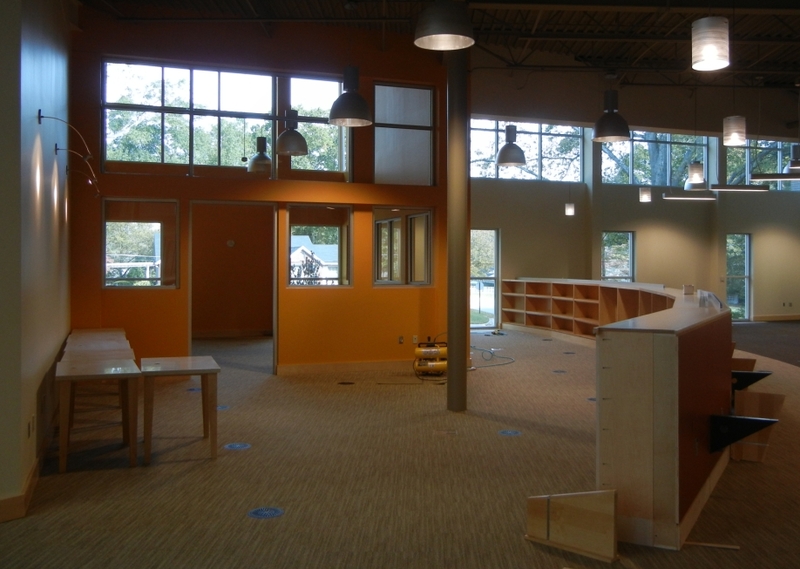 Custom built shelving for Young Adult materials on the right, computers on the left, and a homework room in the back. 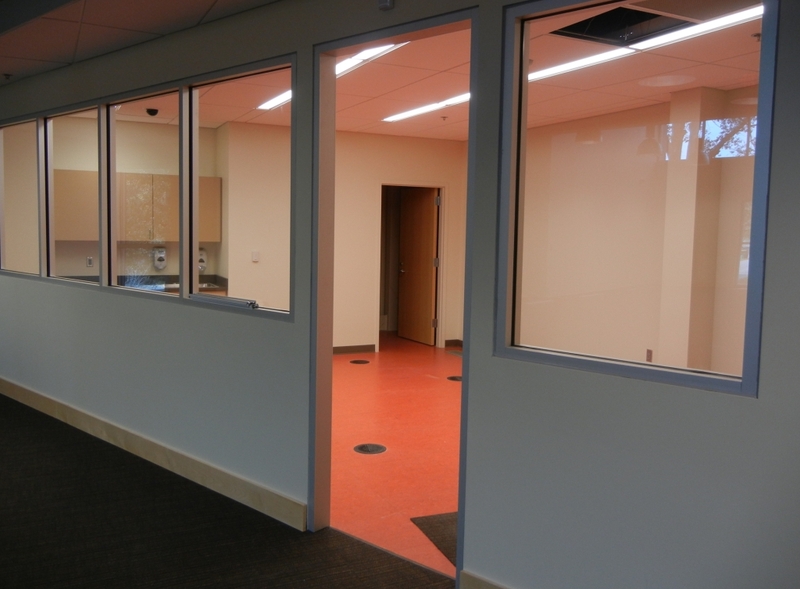 The children’s program room has a durable, resilient floor as well as its own sink to make it easier to clean up after crafting activities. 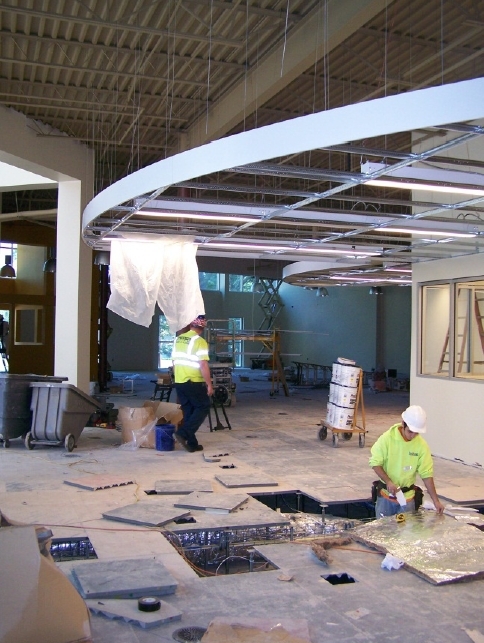 There will be comfortable reading chairs along the curved front window to the right, and the public computer area on the left under the drop ceiling. 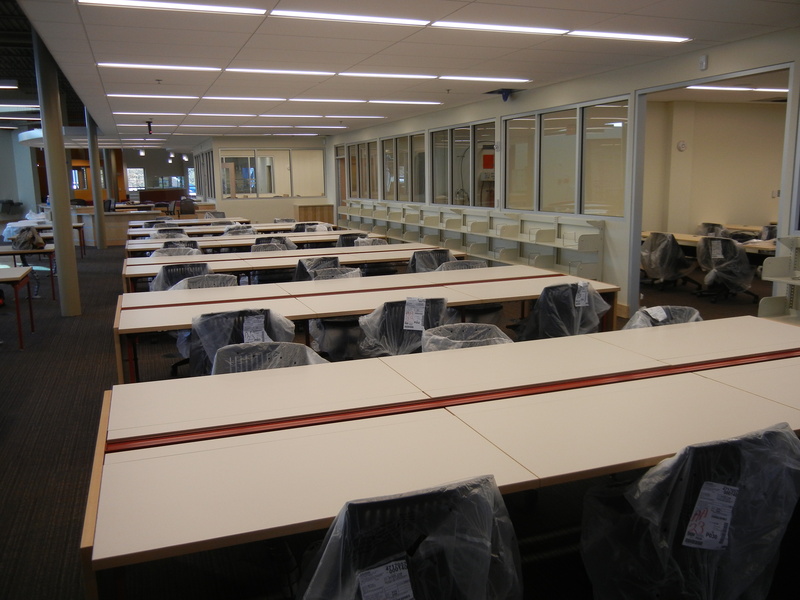 The computer training lab will be in the last room on the left. 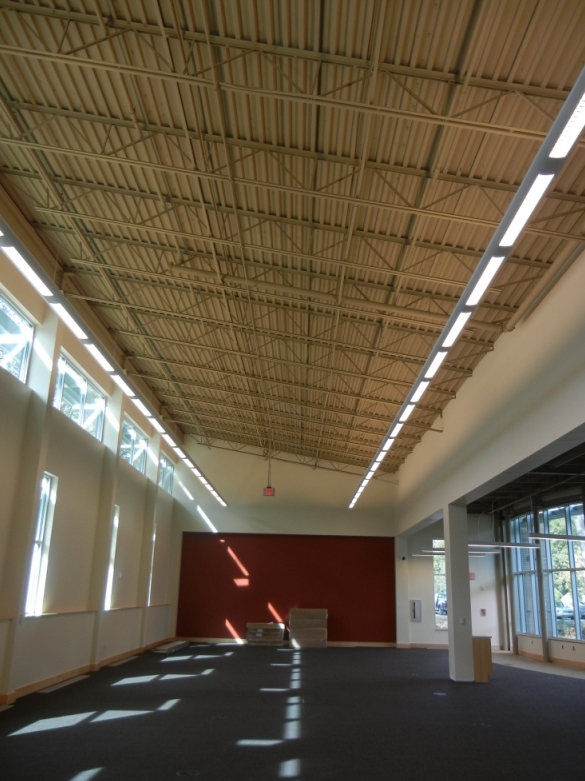 This airy space will house the shelving for the adult fiction and non-fiction collections. 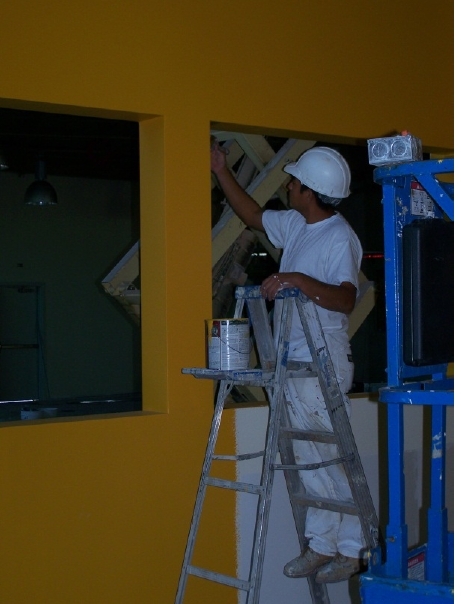 Special shades over the south-facing windows allow in ambient light, but limit the amount of direct light coming in to lower cooling costs in the summer. 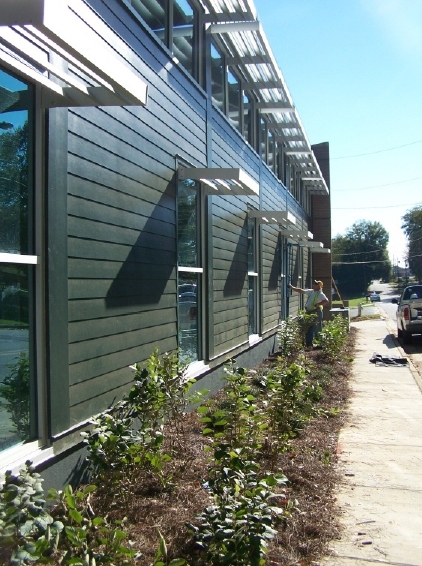 A pretty, curved walkway follows the front curve of the building. 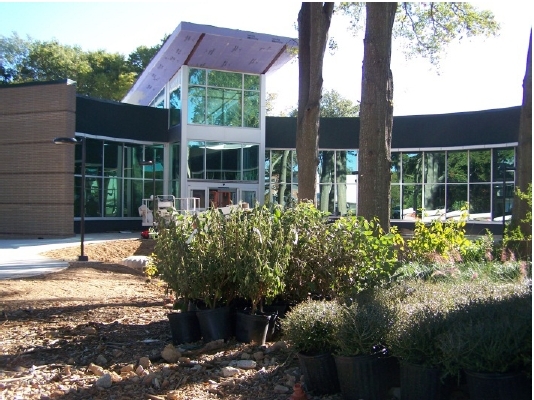 Landscaping has just begun at the front with low-maintenance plants, and there will be benches placed in convenient spots for people waiting for rides, talking on phones, or simply enjoying the small glade of trees that the building curves around. We’re Getting Closer and Closer! 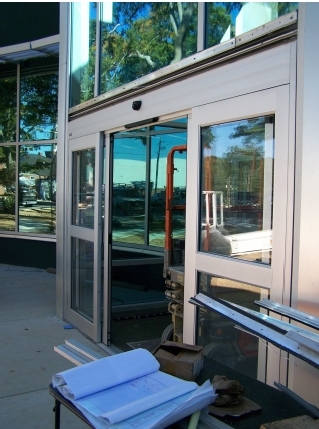 This week’s updates: Installation of light fixtures is progressing, final portions of concrete for the parking area are being poured, most of the solar shades are in place, the glass on the entry vestibule is being installed, toilets and drinking fountains have been installed, the epoxy flooring in the restrooms has been poured, painting continues, and a dropped ceiling grid with lighting is being installed over the computer area and the circulation desk.